Why Christ Matters. A Mother’s saving Grace. I gave a lesson to the Young Women in my church about preparing to establish a Christ-centered home* this last Sunday. It caused me to put my thoughts together and further reflect about why I feel that Christ matters so much. With Christmas just about here, I felt strongly to announce to the world my own feelings about Christ and why it IS such a big deal that little baby in Bethlehem was born. Why is it that so much of the world is celebrating the arrival of this person? Why does it matter that Jesus came? How did it affect the world and how does it affect us personally, every day?? I don’t have all the answers, but I have come to know through my experiences a few, simple things that have helped me get closer to answers, to more hope, to more understanding, to greater happiness and to closer to my Savior, Jesus Christ. Why does it matter that I base myself, family, home and life around Christ? Let me share a personal story about how I came to better terms to why it matters to me. I was having one of those moments as a mother that I realized how blatantly short my efforts fell from being the mother I wanted to be. I found that because of my very human limitations, insecurities, fears, and personal weaknesses, I simply could not show love to my kids as beautifully as I wanted. I got frustrated with them, snapped at them, was easily distracted when I could better be attending their needs and so on. I came to the thought, “Wow, what in the world did my innocent little children do to be raised by a mom like me? Nothing, they did nothing to deserve it. They were just born to me. I realized that no matter the effort I put in, I would still be lacking somewhere. Simply because I am human, weak, temperamental (can you say hormones? ), unwilling, selfish – and- even my very personality and all its flaws that are more or less incompatible with that of my child’s would affect him and his life. I realized my very shortcomings as a human could one way or another mess up my kid. GULP. What a predicament. It hit me that the reason I make the effort to teach, talk, celebrate, write and testify of Christ is because it is HE who will do the saving, NOT ME. If I can just do my best to teach my littles to turn to the Light that is Jesus Christ, they can be redeemed from their weaknesses (sins, insecurities, fears, sorrows), and EVEN the weakness that became theirs because of my influence (my sincere efforts as a mother that simply were not enough). Jesus Christ matters because my children have as much of a chance to enjoy satisfying and true happiness in this life (and the next to come) as I do. Oh what a relief! 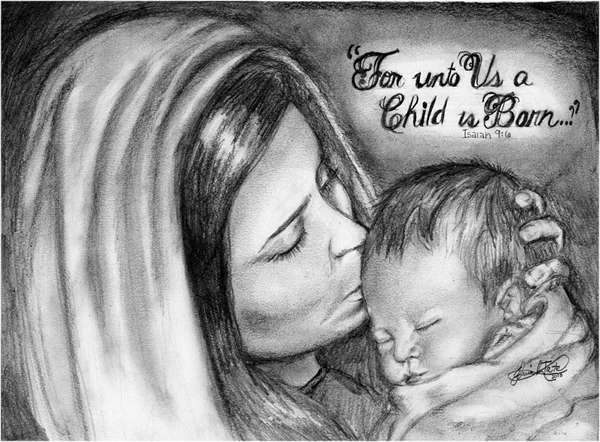 Even though I am human, weak, and SO blunder prone, there is still hope for me as a mother. Christ not only compensates for what I could not do, but enables me to do and be more than I otherwise could on my own as I mother. I have personally experienced the real enabling power of Christ in my life. I have seen it in those moments when I am humble and willing enough to know that I cannot do it alone, when I start relying on His spirit more, those moments of quiet listening to the real voice within that stills me, helps me harness life and myself to do those things that really matter. It comes to me in those miraculous little moments that I didn’t have to get upset, that I stopped and listened, that I sought an opportunity to teach instead instead of punish. Those are the moments that I can more clearly see the light in my child’s eyes, see him for who he is. Love him more sincerely and deeply than ever before and experience a joy more exquisite than I thought possible. He came so we could receive, know and show LOVE. If for some reason the idea of Jesus Christ still seems quite removed for you, perhaps the idea of LOVE can complete it for you. Christ’s whole missions was for love and out of love for us. Christ =LOVE. When we feel true Love we are feeling part of Him. For me it is a feeling that things will be ok, that there is much to be hoped for, much to be happy about, it is a feeling of security within myself, confidence to take on life, the gift of ability to love others and give of myself without fear. He is what makes life beautiful. LOVE is why Christ matters. There is little I want more than Christ and His love in my home. See helpful object lesson on this topic here. 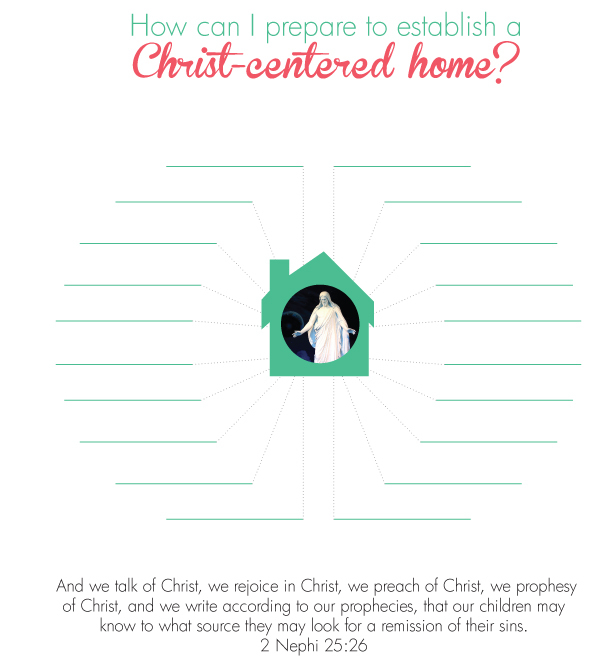 *For lesson helps: In my lesson we talked about ways to create a Christ-centered home. With the help of resources found in the lesson (specifically “For peace at home by Elder G Scott, Family Proclamation, Becoming Goodly Parents, and scripture references) we listed things that help create a Christ-centered home (Here is a handout to use if you are going to be teaching). I was asked if I could create a handout without the ‘prepare to’ so it can be used for more general purposes like Relief Society or family lessons, etc..Here it is!